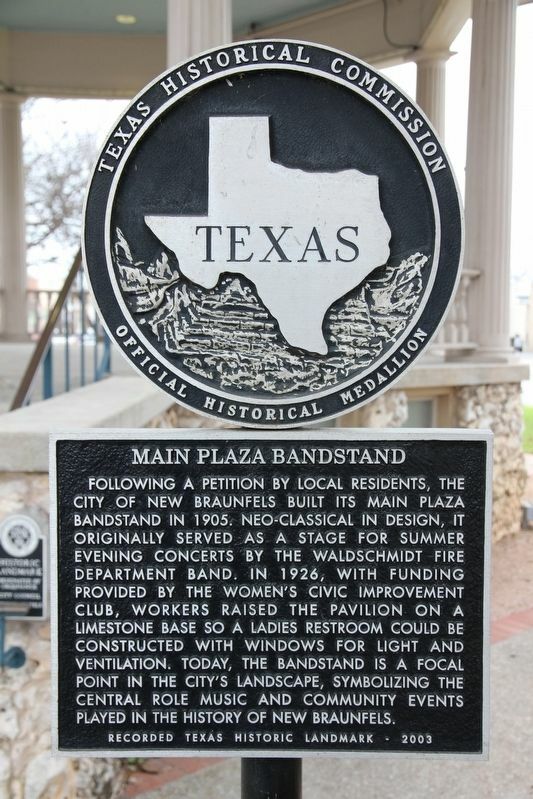 Following a petition by local residents, the City of New Braunfels built its Main Plaza Bandstand in 1905. Neo-classical in design, it originally served as a stage for summer evening concerts by the Waldschmidt Fire Department Band. In 1926, with funding provided by the Women's Civic Improvement Club, workers raised the pavilion on a limestone base so a ladies restroom could be constructed with windows for light and ventilation. 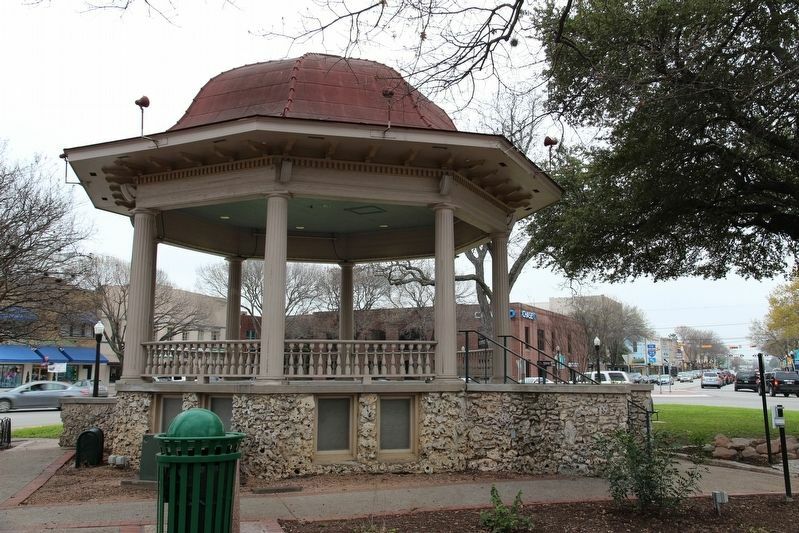 Today, the bandstand is a focal point in the city's landscape, symbolizing the central role music and community events played in the history of New Braunfels. Location. 29° 42.173′ N, 98° 7.489′ W. Marker is in New Braunfels, Texas, in Comal County. Marker is at the intersection of Main Plaza and North Seguin Avenue (Business State Highway 46), on the left when traveling south on Main Plaza. Touch for map. Marker is located in the Main Plaza. Marker is in this post office area: New Braunfels TX 78130, United States of America. Touch for directions. are within walking distance of this marker. Comal County, C.S.A. (within shouting distance of this marker); Site of Old Schmitz Hotel (within shouting distance of this marker); Comal County Courthouse (within shouting distance of this marker); New Braunfels (about 300 feet away, measured in a direct line); Eiband and Fischer General Mercantile (about 300 feet away); Hinmann House (about 500 feet away); 1915 New Braunfels Post Office (about 500 feet away); Spaß und Gemütlichkeit (about 500 feet away). Touch for a list and map of all markers in New Braunfels. More. Search the internet for Main Plaza Bandstand. Credits. This page was last revised on February 22, 2019. This page originally submitted on February 20, 2019, by Brian Anderson of Kingwood, Texas. This page has been viewed 32 times since then. Photos: 1, 2. submitted on February 21, 2019, by Brian Anderson of Kingwood, Texas.